When you are considering going into the sport of wrestling, one of the most important purchases you will need to make is the best wrestling shoes that fit your specific requirements. They are of vital importance and you need to consider a number of things before you purchase. We reviewed the top products, looking at all their vital statistics and giving you a breakdown of their weight, design, supportiveness, flexibility, and traction. We also consider the material, which determines their breathability and durability. View the Best Shoes for Wrestling on the Market, Below. How to Choose the Right Wrestling Shoes? Different Types of Wrestling Shoes? How Long Will Wrestling Shoes Last? How to size Wrestling Shoes? Where to buy Wrestling Shoes? How to Clean Adidas Wrestling Shoes? What to look for when Buying Wrestling shoe? All of these aspects combined make the top wrestling shoes.Your wrestling shoes should be so lightweight and flexible that they give you the feeling that you are not wearing any shoes. You need to have wrestling shoes that support your ankles and offer you great traction on the mat. In our buyers guide we will also answer some of the most frequently asked questions when it comes to selecting the right wrestling shoes. A wrestling match is fast and furious and you need wrestling shoes that are capable of offering you the best support, flexibility, breathability, and traction you can get to be able to keep up with the flow of the match. The ASICS is one of the best wrestling shoes on the market and will offer you everything you need to be able to give your best when taking to the mat. These are high-performance wrestling shoes that will not let you down even during the most intensive sessions. The uppers of the shoes are synthetic and mesh and allow for excellent airflow, keeping your feet cool and dry. The wrestling shoes offer great support for your ankle. The ASICS offers a great snug fit, wrapping your foot in comfort. The lightness of the wrestling shoes ensure that you can perform at your best. A lightweight split-sole design will give you all the flexibility you need to be able quickly and efficiently around the mat. The tread pattern provides superb traction at key pivot points. You will not lose your foot on the mat when wearing these great wrestling shoes even when under duress from your opponent. A wrestling shoe that offers you the support, comfort, flexibility, and traction you need to get the upper hand on the mat. Mesh uppers and rubber soles are lightweight and breathable to ensure that your foot stays cool and comfortable throughout even the most intense matches. Wrestling shoes that are designed to get you around the mat effortless, give you the grip you need to hold off your opponent and a fit that allows you to ease your escape when needed. The Adidas is a two-piece performance wrestling shoe with a mesh upper that is breathable and smooth, with enough slip to help you deflect picks. It is quick drying and great looking. The outsole is suede with rubber inserts to allow for the best grip on the mat at all times. These wrestling shoes fit incredibly well, molding to your feet and giving you the feeling of being barefoot, which allows you to move quickly and the ability to pivot without losing your footing. It is lightweight and will extremely flexible, exactly what you need in a wrestling shoe. A stunning design that is available in various colors and will give you what you need to get the upper hand on your opponent, keeping your feet cool, comfortable and supported even during most intensive wrestling matches. When you are on the mat you need wrestling shoes that will not only give you the support you need but will keep your feet cool, dry and comfortable throughout even the most intense matches. Pivoting and deflecting picks and moving quickly and effortlessly around the mat is a breeze in the Adidas Performance Men's Adizero. This is a feature packed wrestling shoe that offers you everything you need at a reasonable price point. Durable, flexible and lightweight it has all the characteristics you are looking for and more. The Combat Speed 4 fits perfectly, so much so it feels like a sock more than a shoe. Offering a single layer mesh upper that is both breathable and flexible allowing you to move easily around the mat. The TPU 3-stripes and integrated side panel or Integral Support Strap not only re-enforces the snug fit but also offers exceptional ankle support. The slip-suede, leather outsole overlays offer just the right amount of grip needed to be able to make those winning throwdowns and the internal die-cut EVA midsole provides the right amount of comfort for your feet. These are designed to fit as tightly as possible to give you that freedom of movement, so when considering the Adidas Combat Speed 4 shoes you are advised to select a half size larger than when you would normally wear. A wrestling shoe that is designed to offer you the best flexibility, comfort, support and traction you can get when taking on your opponent. Mesh upper and slip-suede leather outsoles, with a die-cut EVA midsole are just some of the great features you get with the Adidas Wrestling Men's Combat Speed 4. 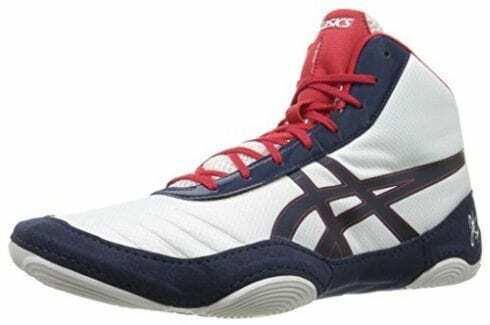 These are great wrestling shoes that are based on the design specifications of Jordan Burroughs, a two time world and Olympic champion wrestler, designed using the best wrestling specific technology to allow you to reach your potential on the mat providing both quality and durability. The upper is a single layer mesh for the best breathability and comfortable fit. The tongue of the wrestling shoes features a non-bulky, integrated lace garage technology, this design meets regulations for tournament competition. Traction on these wrestling shoes are provided by a rubber compound slip sole. The shoe features both rear and forefoot “serradial” traction pods for both flexibility and superb traction on the mat, allowing for fast and accurate movement. Throw downs, picks and pivots are a breeze when wearing these wrestling shoes. When you are wrestling every advantage you can get will help you to succeed and having the best wrestling shoe, such as the Adidas JB Elite , ensures that you have the right amount of grip, flexibility and comfort for your foot that you need to succeed on the mat. The newly redesigned ASICS Men's JB Elite V2.0 is just the wrestling shoes to get you off on the right foot when taking on an opponent, offering just the right amount of flexibility, comfort, support and traction you require to make every throw down, pivot, or pick count. A great wrestling shoe that offers all the features to enable you to succeed on the mat. Comfort, flexibility, stability and support as well as superb traction define this fantastic shoe. The ecsaine synthetic leather uppers are breathable and allow for the flexibility needed in any wrestling shoes. Not only will they move with your foot, they will provide the ankle support you need when wrestling. The integrated lace garage allows you to tuck your shoe laces away in the pocket so you will not trip on them, as well as featuring a less bulky tongue, that is also breathable, ensure ultimate comfort. The rubber sole provides superb traction. A Cael Sanderson signature shoe, the traction which is designed with wrestling specific traction zones, as well as incredible flexibility will ensure that you will not lose your footing during a match. These are very popular wrestling shoes that offers you everything you need to be able to perform at your very best on the mat every time. These are very popular and well-designed wrestling shoes that will offer you comfort, support, and superb traction with its wrestling specific traction zones. This is a Cael Sanderson signature shoe so you know you are getting a quality wrestling shoe that allows for optimal performance on the mat. The Adidas Wrestling Men’s Response 3.1 is a well-designed, stylish wrestling shoes that offer a host of features to ensure your success on the mat. The synthetic mesh upper is breathable and fits your foot snugly. It offers support for your ankle and keeps your foot stable. The shaft of these wrestling shoes measure about 4” from arch and it offers a 0.7” heel. The shoes are extremely durable and has a yellow, white and black coloring. Traction is provided by the rubber sole and man-made outsole. The traction of the wrestling shoes are designed to enable you to move and pivot easily on the mat without losing your footing. The rounded toe area on these wrestling shoes keep your forefoot comfortable and secure during the match. The Adidas Wrestling Men's Response 3.1 is a lightweight wrestling shoe that gives you the feeling of being barefoot, allowing you to move around the mat with ease. These are highly responsive shoes that allow you to avoid picks and make those match winning throw downs in style. The Adidas Wrestling Men's Response 3.1 gives you everything you need in wrestling shoes. It is lightweight, flexible, supportive, comfortable and most of all offers great traction. These qualities will ensure that you are able to perform at your best every time you step onto the mat. A well designed, lightweight and highly responsive wrestling shoes that offer durability and flexibility as well as exceptional grip on the mat. The synthetic suede and leather uppers are not only durable but will support your foot, providing the ankle support that is so crucial in wrestling. The single layer mesh makes this wrestling shoe breathable keeping your feet cool and dry during training and matches. The lace straps are elasticized. This feature ensures that the laces of the shoe remain securely tied during match play, which is vital as the last thing you need is to be tripping over a pair of shoe laces and giving your opponent the upper hand. The full length rubber sole is designed to offer you the best traction you can get, allowing you to grip the mat and keep your feet firmly planted. Keeping your footing is vital in any wrestling match and the HVC2 Speed will not let you down when you need a solid grip on the mat. In order to perform on the mat you require great traction, excellent ankle support, superb flexibility as well as responsiveness in a wrestling shoe. The Adidas HVC2 Speed provides all of this and more, allowing you to take your wrestling to the next level with confidence. Strong, durable, lightweight, flexible and great traction, these are all the qualities you can expect from the Adidas Performance Men’s Mat Wizard 3. The 3D mesh upper is designed to allow your foot to breathe and to keep it cool and dry at all time. The underlays, which are strong and durable offer the support you require in the midfoot and ankle. The wrestling shoe is extremely lightweight and fits your foot like a glove. You get added support through the synthetic 3-stripes and reinforced upper, both of these features are designed to allow you to move with confidence at lightning speeds around the mat. A freestyle wrestler’s shoe, the upper has reinforcements for added support and one-piece outsole and rubber sole, are designed to offer you maximum, multi-direction grip, and excellent support and comfort, so you can be sure to keep your footing on the mat when you need it most. 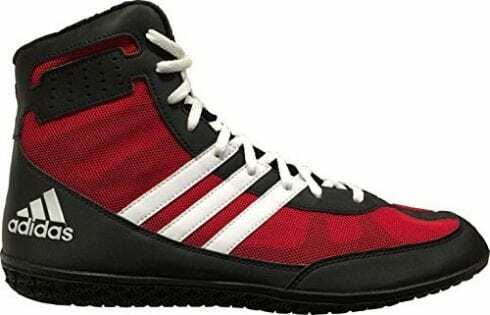 These are well designed, stylish and supportive freestyle wrestling shoes that offer you the best traction with a one-piece synthetic outsole, breathability with a 3D mesh upper and excellent support with the underlays and 3-stripe reinforced upper. Flexible, durable and lightweight, these mat wizard wrestling shoes offer everything you need in wrestling shoes. The ASICS Men’s Dan Gable Ultimate 4 are superb wrestling shoes that meet all the regulations for tournament competition and give you an edge when competing on the mat.The compression-fit bootie system with thin polyurethane support pods that surround the wrestling shoes offer you the best flexibility and comfort as well as offering you exceptional tight fitting wrestling shoes, you will not feel like you are wearing wrestling shoes at all. The synthetic ecsaine upper is lightweight and breathable to keep your feet cool and dry and the lace garage ensures that your laces stay tucked nicely.The rubber sole with a split sole design offers superb traction. The outsole design features wrestling-specific traction zones and is light and flexible to ensure the best performance on collegiate mat surfaces. 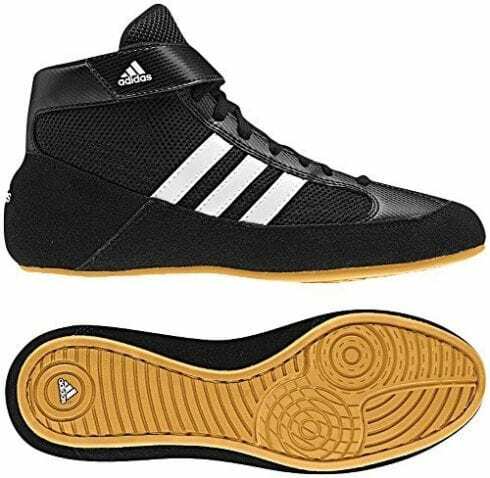 Moving around the mat, deflecting picks and making those match winning throw downs are made easy with these great wrestling shoes from the Dan Gable franchise. 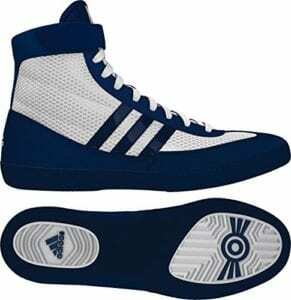 These Dan Gable franchise redesigned wrestling shoes have everything a serious wrestler needs to succeed on the mat. Comfortable, flexible and with wrestling specific traction zones, combined with superb support for your feet and ankles this is definitely one of the best wrestling shoes on the market today. The Adidas Pretereo III has been completely redesigned with a unique, cool upper, a proven London Olympics outsole and is one of the most lightweight wrestling shoes on the market that requires no break in period. These wrestling shoes have a host of features that include a rubber outsole that offers excellent grip in all directions. Anti-slip lining will make sure that you do not slip and fall at inopportune times during a match. The reinforced ankle zone along with a supportive heel structure with two drive zones, supports both foot and ankle as well as allowing for great flexibility. The single layer mesh upper is breathable and lightweight.The lace-up construction ensures that your foot remains secure in the wrestling shoes. 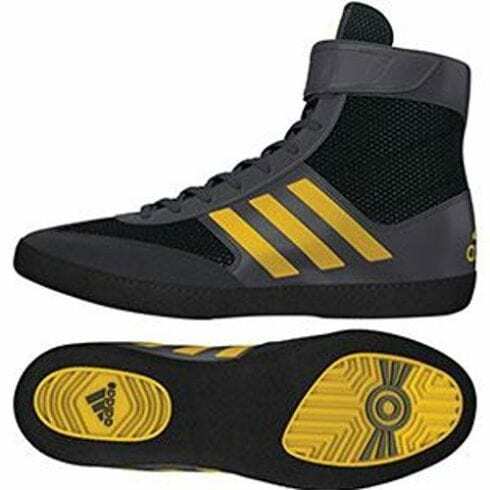 The shoes are a grey and gold color which is a common team color and they start from a size 4.0 up to a size 15.0, so will be suitable as kids and youth wrestling shoes as well. 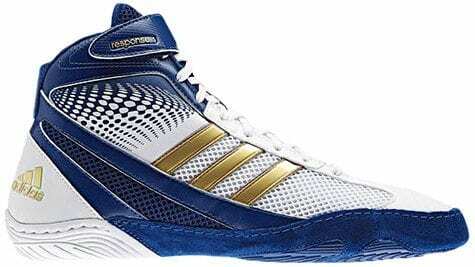 These are superb wrestling shoes for all age groups as they range in sizes from 4 to 15. Featuring great support for both ankle and heel, anti-slip lining and excellent traction with two drive zones. The lace-up construction of these wrestling shoes ensure they stay firmly on the foot at all times. These are wrestling shoes that are durable, comfortable, supportive and flexible, as well as providing the best traction on the mat. These are performance wrestling shoes that are designed to give you great balance and enables you to take your wrestling to the next level. The synthetic ecsaine upper with a shaft that measures about mid-top from arch are lightweight and breathable. They are also very lightweight and the lace garage keeps your laces nicely tucked away and unexposed. These wrestling shoes are all about flexibility and durability. The suede upper construction is designed to minimize wear and tear to increase its lifespan. The DuoSole outsole will not only reduce the weight of the wrestling shoes, but also offer excellent flexibility and outstanding traction on the mat. It features a molded tooth pattern which ensures that you get the grip you need as well as the balance required to be able to perform at your best. A superb wrestling shoe that offers you the features such as excellent traction, great support, a lace garage to keep your laces tucked away and a DuoSole outsole which is not only flexible but also very durable. These wrestling shoes will last you for a long time and will help you to perform at your best on the mat. The Combat Speed.5 is not only flexible but also very supportive and has a tight, snug fit with exceptional traction for secure grip on the mat at all times. These are also very lightweight wrestling shoes that will not weigh you down when wrestling. The single layer mesh upper is breathable keeping your feet cool and dry, and it fit is such that is has a “sock like” effect when wearing it. The TPU 3-stripes and integrated side panel or Integral Support Strap will reinforce the fit offering ultimate comfort and support when wrestling. The internal, die-cut EVA midsole offers another layer of comfort to these wrestling shoes. The split outsole is suede with leather overlays that ensure you get the grip you need on the mat. The rubber sole adds to the traction offered by the shoe. This is a very cool wrestling shoes that rival all others in comfort, support and traction and you can be sure you are getting quality when purchasing this wrestling shoe. Lightweight, comfortable and extremely supportive this wrestling shoe also provides the traction that you need to be able to perform at your best on the mat. The integral support strap and single layer mesh upper ensure great flexibility and support. These are great wrestling shoes and one of the best on the market for 2017. Buying a pair of wrestling shoes is one of the most important decisions a wrestler can make. Wrestlers do not have many kits that they require for their sport, but their shoes are their anchor point and are the most important part of their kit. You will need to look at a lot of different aspects when considering which shoes you will need, and it will depend on your individual wrestling needs. The qualities you need to look for is that the wrestling shoes are lightweight, flexible, give you the grip you need and importantly the ankle support you require to give your foot and leg the support it needs to anchor you properly. The more expensive the shoe, the better the qualities of the shoes. 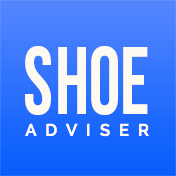 Beginners will not want expensive shoes to start with, they will need a cheaper shoe because as their skill level changes, their need in shoes will also differ. The quality and type of material will play an important role in the shoe that you select as will the sole of the shoe and type of traction you can expect. When selecting the best pair of wrestling shoes, you need to consider a lot of different things to ensure that you take your matches to a new level of excellence. These shoes are specifically designed to allow you to perform at your best on the mat when performing holds, pins, and throws and making that winning takedown. You need to consider the fit, ankle supports the shoe will provide, type of material that is used as well as what kind of traction you can expect from the shoe. We take a look at what you need to consider a little closer in order for you to make the right choice of shoe to suit your style and needs. A wrestling shoe needs to mold to your foot like a sock. It should fit tightly and snugly hugging your foot as a shoe that is loose will inhibit your ability to move easily around the mat, it will also affect your speed of movement and the amount of traction you will get out of the shoe. When selecting one a wrestling shoe you should be aware that they usually are a half size smaller than your normal athletic shoes, this is because they need to have that very tight fit. The shoe will stretch out after you have broken them in, and you need to ensure that after the break in period it is not stretched too far to be effective. A heavyweight wrestler will require a less tight fit than a lightweight wrestler, this is because a lightweight will need more flexibility to move around quickly and to pivot easily. A heavyweight wrestler, on the other hand, relies a lot on their upper body strength when wrestling and do not need the flexibility that a lightweight does. This is one of the more crucial aspects of your wrestling shoe. The reason for this is that you need to have a strong stance on the mat. To be able to accomplish this your legs and feet need strong support. Most of the wrestling shoes on the market will extend over your ankle for maximum support. The lacing of the shoe should also offer lacing that will also fit snugly against your foot and angle as well as a lace garage. A lace garage is a system that allows you to tuck your laces in behind the tongue of the shoe to keep them out of the way and stop them from becoming untied during your matches. In high school wrestling this is really important as the rules require the laces to be covered and if you do not have a shoe that offers the lace garage, you will have to tape the laces to the shoe. The shoe that you choose should be made from a material that is lightweight and durable. Materials such as leather, mesh or nylon are preferable as they will not only increase your flexibility but also your speed and comfort. Built up of sweat in your shoe is not at all desirable, therefore good airflow through the shoe is imperative to a good wrestling shoe. Quality of material is another aspect you can take into consideration. If you are looking for a wrestling shoe for a heavyweight wrestling shoe or for those that are professional wrestlers are those that are made of leather or nylon. 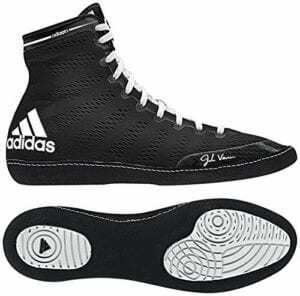 These may some of the most expensive wrestling shoes, however, they are also the most durable and strong. The best wrestling shoes for beginners would be those that do not cost as much as they may outgrow their shoes or need to change their shoes for more advanced pairs in short periods of time. Lightweight shoes with mesh uppers are perfect for these types of wrestlers as well as lightweight wrestlers who need shoes that help for the speed of movement. When talking soles of wrestling shoes there are two distinctive types. Insoles and Split soles. These two types of shoes are specifically suited to different wrestlers depending on whether they are lightweights or heavyweights. Insoles are single pieces of rubber which run the full length of the shoe. These types of shoes are perfect for the heavyweight wrestler who usually remains in a flat stance with feet planted on the mat. They are great for distributing your weight evenly and allowing you to perform more effective throws. Split soles, on the other hand, are the types of soles that a lightweight wrestler would look at getting. This type of shoe has a sole that consists of two separate strips of rubber. The lower strip will support the heel, and the top one supports the ball of the foot. These shoes allow for faster movement and more flexibility as they allow the different areas of your feet to move independently of each other. These wrestling shoes are great for lightweight wrestlers who need to be able to move effectively on the mat, pivoting quickly. Traction is all important to a wrestler. Traction will differ in wrestling shoes depending on what type of wrestler you are. If you are a heavyweight wrestler you will require traction that allows you to execute power throws and holds. Here a sole with ridges that cut into the mat is ideal. Lightweight wrestlers, on the other hand, need circular traction patterns, this will allow you to move quickly without slipping on the mat which is what a lightweight wrestler needs to be able to do. The areas where wrestling shoes differ are in the material used in the upper, the type of sole and outsole as well as the type of traction on the soles. There is no functional differences between men’s and ladies wrestling shoes apart from the color of the shoe. The defining difference in wrestling shoes is the sole and the type of material used in the different shoes as well as the fit of the shoe. These are shoes that look like the sole has been split into two different sections. The heel and the ball of the foot are separated by a distinct gap. This is a split sole. These types of soles are used for lightweight wrestlers who need to be very mobile and flexible on the mat. These soles are continuous. They go from the one side of the shoe to the other, or from heel to toe, without a gap. These types of soles provide the best grip and is usually a favorite of the heavyweight wrestler as they use more upper body strength instead of footwork to get the job done on the mat. Lightweight wrestlers need a tighter fitting shoe to provide the flexibility they need to be able to move effortlessly and quickly. Heavyweight or new wrestlers prefer a slightly looser fit in their shoes. Leather and suede are great materials that are used in wrestling shoes. These are breathable and lightweight and are perfect for the heavyweight wrestler to have in their shoes. Mesh material is the perfect material for lightweight wrestlers as they are extremely lightweight and will offer a sock-like fit allowing for flexibility and speed. These are also extremely breathable. 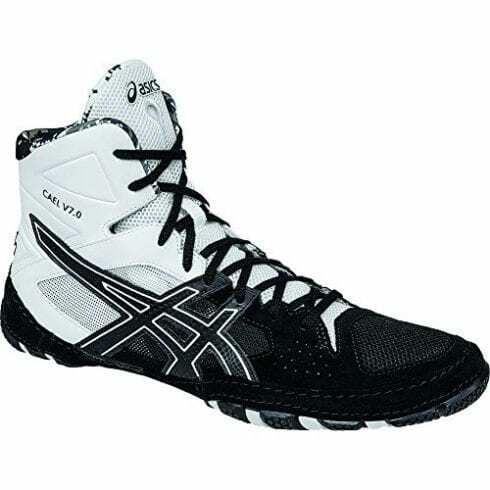 Heavyweight wrestlers will choose a wrestling shoe with more pronounced tread patterns that will allow them to anchor themselves to the mat when wrestling. Lightweight wrestlers, on the other hand, need finer, more circular pattern treads to enable them to grip the mat and move quickly and efficiently around. The best wrestling shoes will last about a year, or maybe two depending on how much wrestling you are doing. It is not just expense that will determine how long your shoe lasts, it is the amount of training and actual match play you engage in that will determine the lifespan. It will also depend on how aggressively you wrestle. If you are a part time, or casual wrestler, then you will get a lot more use out of your shoes than if you are a competitive wrestler. Competitive wrestlers generally get one season, sometimes less out of their shoes. Wrestling shoes will differ between brands and of course models or styles of shoe. Wrestling shoes need to be as tight fitting as possible, especially for lightweight wrestlers who need to be flexible and fast. Beginners and heavyweight wrestlers, on the other hand, may need little looser fitting shoes. Remember you wrestling shoes will stretch as you use them, so you need to get a tighter fitting shoe and so that when they have been “broken in” and stretched out a bit after this period, they will still be tight fitting enough. You will generally find that the ASICS and Adidas offer a very tight fit and you will need to take at least a size larger than you would in a regular athletic shoe. Nike wrestling shoes, on the other hand, tend to be a lot more true to size, and if anything you may need to look at about a half size larger than normal. You can buy your wrestling shoes at any good sporting goods store, as well as some other stores. 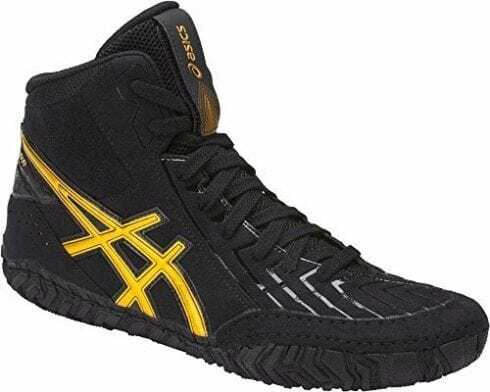 However, if you are looking for the greatest selection of shoes from the most expensive wrestling shoes to shoes for kids, youths, and novices, then you should look online at stores such as Amazon to get your wrestling shoes. Just remember to read the manufacturers advice when it comes to sizing and you will be well on your way to performing better on the mat with your new wrestling shoes. Taking care of your wrestling shoes will not only extend their lifespan but also help to prevent you from getting a skin infection such as ringworm, staph infections and the like, all of these diseases can be spread on the dirty wrestling mats you use. First, you will need the tools to clean your shoes, these include a large bowl or basin, warm water, and a soft washcloth. Then you can clean your shoes following the steps listed below. Fill your basin with warm water. Do not use any kind of soap or other detergents. Using any kind of cleaning solutions as they will damage your shoes. 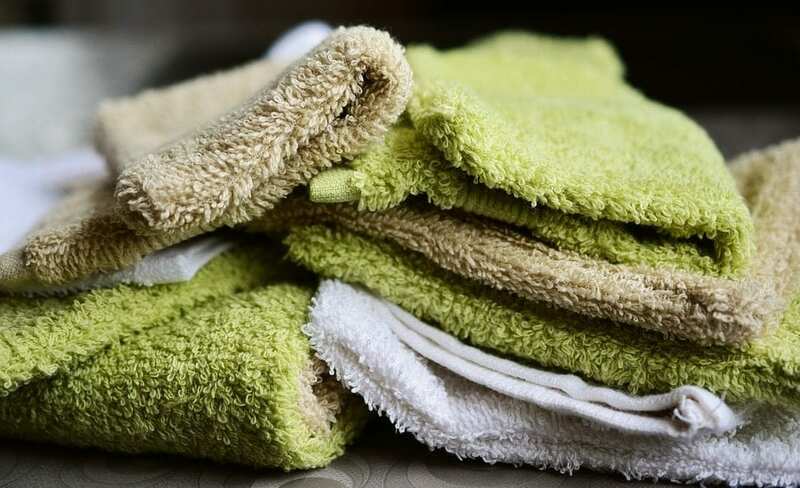 Dip your cloth into the warm water and then gently rub your shoes down. Make sure you use a circular motion and do not scrub the shoes. The type of materials these shoes are made from the stains and dirt should come off with a gentle rubbing of the wet cloth. Ensure the cloth is not dripping wet as this could also lead to damage to your shoe. Once you have removed all the dirt, grime and stains from your wrestling shoes you should leave them out to dry. Do not dry them using a cloth, either by patting them dry or wiping them dry, this could also lead to you causing some damage to the shoes. Your shoes should dry overnight by themselves. Wrestling shoes are meant to have a tight fit and any aggressive scrubbing or cleaning or putting them into a washer will stretch them and negate the perfect fit you took so long to find. Finally, you should always read the instructions by the Adidas for your particular style of wrestling shoe on how to clean them in order to ensure that you are cleaning them the right way. This is really important when it comes to wrestling shoes. You need to have a shoe that not only offers you great support but unsurpassable comfort at well. A wrestling shoe that fits like a sock and feels like it is wrapping your foot and ankle holding it nicely is what you are looking for. The sole should also offer your underfoot a nice level of comfort and flexibility so that your foot has freedom of movement like it is not being curtailed by a shoe. The breathability of the shoe adds to your comfort level. You do not want a shoe that sweats a lot as it will become slippery and make you feel uncomfortable. A wrestling shoe should be as lightweight as possible to give you that barefoot feeling. The material the wrestling shoe is made from will determine not only the comfort levels but also the quality and durability of the shoe. Most wrestling shoes are made from either mesh, leather, suede or nylon. The reason for this is that these materials allow the shoe to stay dry, and are lightweight so allow for your foot to move freely adding to your foot speed. The different price points of wrestling shoes usually determine what kind of material is used. The cheaper wrestling shoes are usually made from nylon. These shoes have fewer venting points and are great for beginners or part time wrestlers. Mid-range priced wrestling shoes usually have a mesh upper. This is a great material for allowing airflow through the shoe, it is also very light and flexible. A great shoe for those who wrestle competitively. The more expensive shoes are made from leather or suede. These materials offer a tighter fit. Are extremely durable and flexible and will offer a higher level of comfort than some other wrestling shoes. They may not be as breathable as the mesh uppers but are a lot more durable. These shoes are used by the professionals who usually have a number of pairs that they rotate. The type of material you would look for in a shoe will depend on not only your level of experience but also the style of wrestling and the weight category you wrestle in. Lightweight wrestlers often prefer the mesh uppers as they are a lot lighter and moisture resistant which is perfect for their style of wrestling. Heavyweight wrestlers will usually go for the leather or suede uppers as they are a lot more durable, and although they are not as breathable or lightweight as mesh, they suit the heavyweights style of wrestling which depends largely on having a firm grip on the mat and using their upper body strength to gain the throwdowns they need to win the match. Here again, there will be a difference in your selection depending on the style and weight category you wrestle in. The traction on your shoe will make a great difference in your performance and is one of the most important aspects of the shoe besides the sole of the shoe. Although all wrestling shoes are designed to offer you the best traction on the mat, there are different types of traction. Although each brand has their own specific traction patterns they are generally split into two categories, although some brands do have their own hybrid tractions. Let’s look at the two main types of traction patterns to give you an idea what to look for when deciding what type of traction pattern you need. This is the type of traction you would need if you are a heavyweight wrestler. The reason for this is that when you wrestle in the heavyweight division, moving quickly around the mat is not as important as being able to have a firm stance on the mat. Your throws and locks are made using your upper body strength, but to be able to perform these your body needs a firm base. This is where superb traction with exceptional grip is what you need. This is the type of traction generally sought after by lightweight wrestlers. The reason for that is that this type of traction is finer and allows for a lot of traction when moving swiftly around the mat. Fast footwork, pivoting and more is required when you are wrestling in the lightweight category and this type of traction will prevent you from slipping even when placing your feet at various angles. They way that wrestling shoes provide this type of support is through the high length of the shoe top which covers the ankle as well. This supports the ankle as you are moving around the mat, no matter at what angle you place your feet. Another important aspect for you to achieve the kind of support you need is to have a proper lacing structure. The laces help to support your ankles by tightening the shoe around the ankle area. 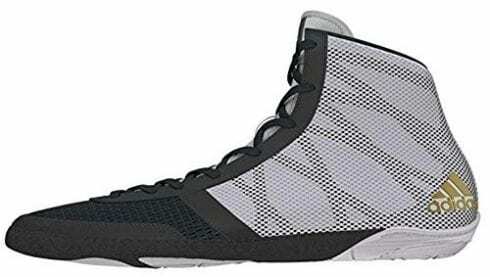 Some of the top wrestling shoes even include an additional strap at the top of the shoe around the ankle that adds to the support offered by the laces. The weight of the shoe is integral to the wrestling shoe. The reason is that you need to be able to move around the mat freely. You need a shoe that is not going to weigh you down in any way, even the amount of sweat you get when wrestling can cause the shoe to become a little heavier and this can affect your performance. This is why wrestling shoes are made from lightweight materials such as mesh. The lighter the shoe, the more flexible it is and the more of a sock-like effect the shoe offers. Heavyweight wrestlers sometimes opt for a slightly heavier shoe as they require a different type of flexibility to the shoe, they do not move around as much and need to have a firm stance on the mat, whereas the lightweight wrestler looks for the lightest pair of wrestling shoes they can get to enable them to move freely. Buying the right wrestling shoe is important. In fact, it is the most important part of any wrestler’s kit. It should provide support, comfort, traction, and flexibility. The top wrestling shoes will give you the upper hand over your opponents and allow you to move effortlessly around the mat without slipping, allowing you to make the picks, pivots, and throwdowns you need to make to win the match. 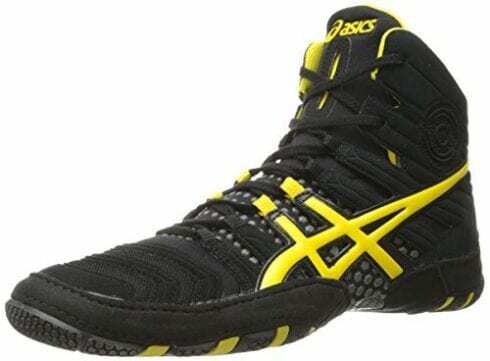 ASICS Men’s Split Second 9 is our top choice out of the list of top wrestling shoes we have put together. This shoe is flexible, supportive and made from breathable material. The traction on the shoe is superb and it is a great wrestling shoe that will allow you to reach your full potential in competitions. These are high performance shoes with synthetic and mesh uppers that wrap around your foot and supporting your ankle as well as keeping your feet cool and dry. The mesh material is extremely breathable and allows for excellent airflow. The fit and lightness of the shoe allows a wrestler to move quickly, preforming pivots and throwdowns with ease.The sole of the ASICS is a split sole design. This means that the rear and fore of the foot can operate independently of each other, offering you great flexibility and gives you that barefoot feeling. The traction on the shoe provides you with the ability to move quickly and it is structured to provide you extra traction at the key pivot points on the shoe. A great wrestling shoe that any lightweight wrestler will really appreciate with all the attributes that are desirable, grip, support and flexibility. A great wrestling shoe that offers you the best comfort, support and flexibility on the market, along with superb traction on the sole of the shoe this is the perfect wrestling shoe and that is why we have chosen it as our premium choice wrestling shoe for 2019. Designed to get you moving around the mat without any danger of slipping, it will also allow you to escape from holds as it offers a tight snug fit. The two piece shoe is a performance wrestling shoe with a mesh upper that is not only smooth and with enough slip to allow you to deflect picks, but also breathable and extremely comfortable. It is also quick drying so even if you sweat profusely during a match the shoe will dry out quickly keeping your feet and ankles cool and dry. The suede outsole has rubber inserts which allow you to get the best grip on the mat no matter the circumstances. Lightweight it will not place any drag on your foot. The sole molds to your foot, giving you the sock like effect and enhancing the flexibility of the shoe. A shoe that offers you everything a great wrestling shoe should offering durability, flexibility, comfort and great traction, you could not ask for a better wrestling shoe at a great price point. The single layer mesh upper which fits snugly to your foot and ankle and is both breathable and flexible. It has a sock like feel to it as it molds to your foot. The TPU 3-stripes with integrated side panel or integral support strap will re-enforce the flexibility and comfort of the shoe and offer you exceptional ankle support. The split-suede leather outsole overlays give you the grip on the mat you need to make the throwdowns and pivot quickly and effortlessly moving smoothly around the mat. The internal die-cut EVA midsole provides an extra layer of support and comfort. Designed to fit tightly as all wrestling shoes should, it does not restrict your foot, on the contrary it provides freedom of moment and flexibility of the foot from ankle to heel to toe. This shoe is designed to fit like a sock, it is advisable to select at least a half size larger shoe than normal when purchasing. Quality, great features and excellent price make the Adidas Wrestling Men’s Combat Speed 4 our great value pick for 2019. We hope you enjoyed our article on "The 12 Best Wrestling Shoes", if so, please share and rate it. 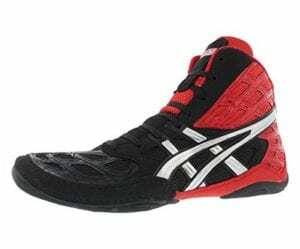 Great review, my choice would have to be Asics men’s aggressor 3 Wrestling Shoe as it gives me good traction and flexibility on the mat.